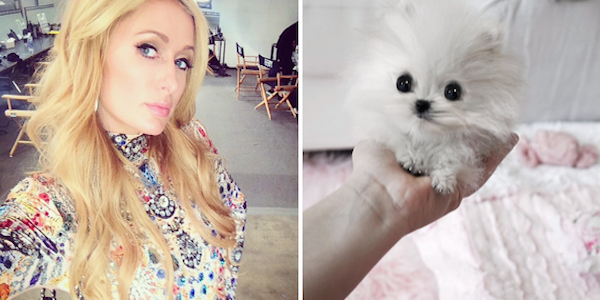 Paris Hilton bought the tiniest and cutest pomeranian puppy. The little pup is a speciality breed that Paris had to order from Calgary. According to The Calgary Sun, Joanne Pauze of Betty’s Tea Cup Yorkies, did not reveal how much the socialite paid for the dog and added that it was worth $13,000. “He’s really quiet and extremely loving,” said Joanna. The dog is two-and-a-half inches long and stands just under two inches tall and she used to call him Mr. Amazing. The little bundle only weighs 330 grams. According to CBC, Joanne said Paris found her company on Twitter before contacting her about the sale, which led to followup emails, texts and phone calls. It’s unknown whether Paris will keep the name Mr. Amazing for her new pet.